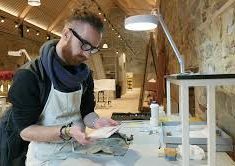 Conservator Jan Cutajar first came to Knole in 2014, as an intern from University College London, where he was completing his Master’s degree in Conservation for Archaeology and Museums. 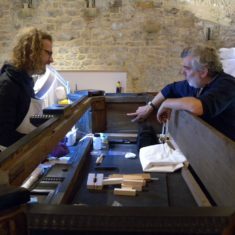 In 2016, he worked closely with Knole’s Project Archaeologist Nathalie Cohen, in finds retrieval and conserving the three 17th century letters found under the floorboards in the attics. 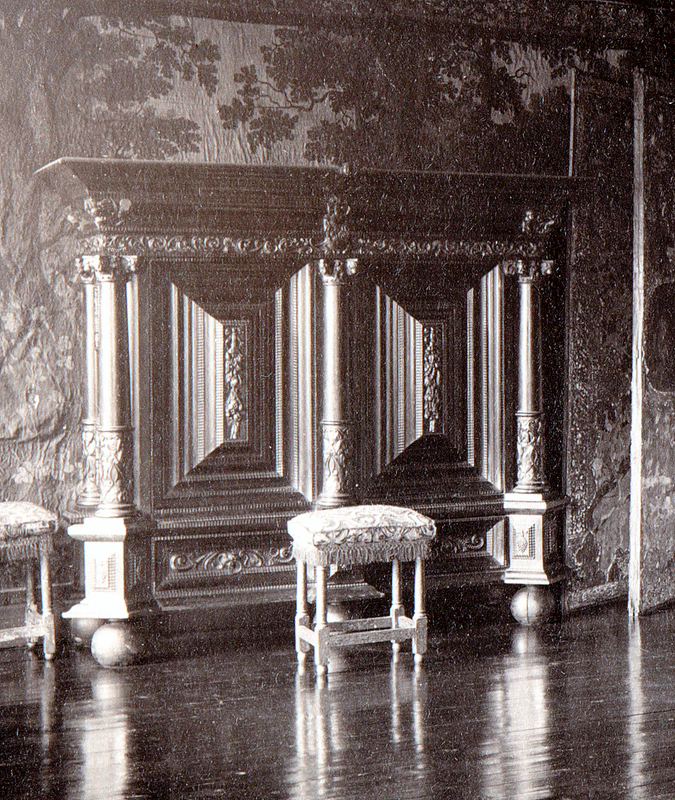 In 2017, he was contracted to work solely on conserving the kussenkast, the Dutch word for ‘cushion cupboard’. 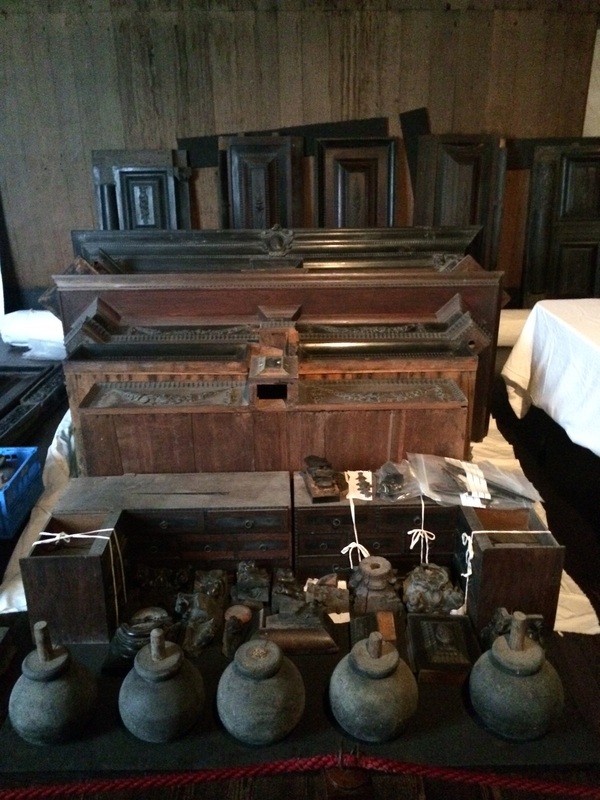 This was also discovered in the attics, during the Inspired by Knole Project. 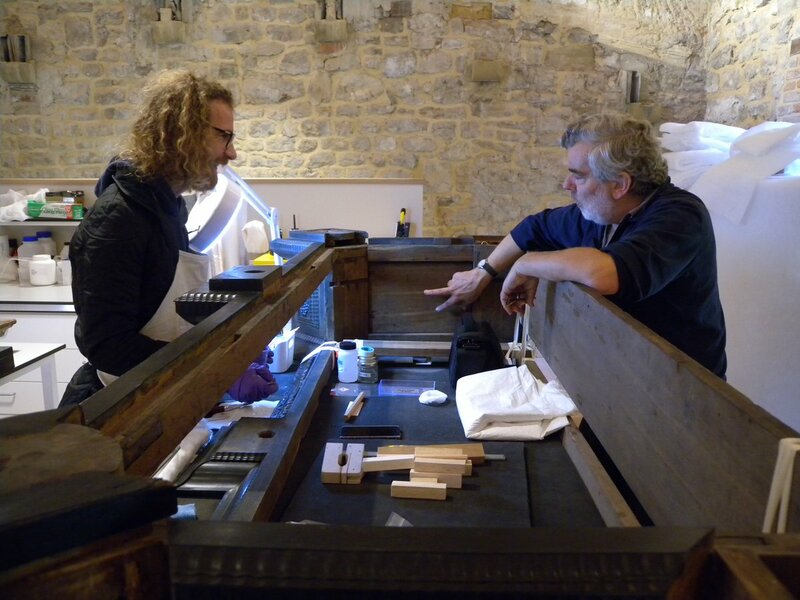 His work involved research, cleaning, and stabilising the 60-70 pieces of ebony-veneered, oak-framed pieces of furniture and finding out how to put them all together again. 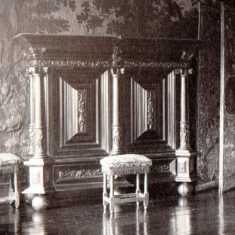 The whole object is now displayed in the Spangle Bedroom at Knole in 2019. We’ve had to re-make some structural parts because they were missing. And they were vital for the stabilisation of the piece. So this is where David Noon has been essential. He’s always very keen to be involved. Ever since I was an intern, he was always there with me. 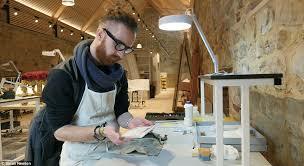 Thanks to him, we’ve been able to make the runners and braces which go on the base. As we also have the shelves and back planks missing, we’ve made rails which slot into the side panels, into the mortices; they act as arms, keeping everything together, it’s sort of structural. We were really lucky because Nat, the Project Archaeologist is in good contact with Ian Tyers who is dendrochronologist here in England, who’s quite well renowned. And we managed to rope him in to do some dendrochronology not only on the kussenkast but also on other frames in the Studio. He was really, really keen to do this work he hadn’t had the chance to work on such pieces of furniture before. So it was really exciting to work with him. The reason we decided to do this is that we had so many disassociated elements, which meant that then Ian could see the oak framework. So Ian was able to look at the right faces of the wood from which he could look at the tree rings, the right sections from which he could estimate a date of felling. So he used several elements both on the framework and which had detached. He did his magic, well more science than magic, I should say. And comparing to his database which he’s built up throughout his career, and other comparative databases which are found in Europe. He managed to estimate the date of felling of the oak framework quite precisely to the winter of 1652. So it’s likely then that the kussenkast was made in the ‘50s or the ‘60s. It’s very exciting to have such a specific date. He also tried to look at the source of the wood: and all the evidence pointed towards a Baltic oak which possibly could have come from the forests of east Poland, Belarus, which still exist to this day and now are a natural park. Well, we can’t say 100 percent, but it’s a possible indication that it could be a source. It took less time than you thought it might? Yes, with these things you never know how it will all go together until you actually try to do it. 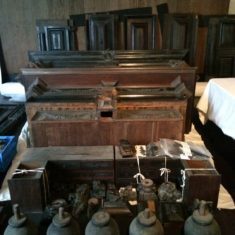 And because the pieces were kept separate for such a long time, there was no way of knowing until we did this, whether pieces had warped or whether they would have shrunk or there would have been other factors which would have impeded its construction. But we were lucky and thanks to all the structural work we had done previously as well, everything was stable enough to be handled. And then fitted, slotted in very nicely. Especially when we lifted the top, which was the final stage – we were anticipating troubles – but it went really smooth so it was quite a pleasure. So it was cleaned first using a combination of methods. So first I used sable brushes just to gently take off the dirt, then I used a material called Groom Stick which is a synthetic rubber – which smells pretty badly – but does a very good job. What it does is it’s very good at picking up organic, particulate matter. So it’s very good at picking up soot, and dead skin cells which get compacted, and it does a really good job. For organic materials in general, it’s widely used. For paper maybe not so much, because there are concerns maybe that it might leave a residue on the paper. But I found that in this case it was suitable to use and it really did what I wanted it to do. So was that helped by the quality of the paper, because it could have inscribed itself in some way? It’s the nature of the dirt, the way the paper was stored, all of this affects how easy the treatment will be afterwards. Yes, I think it’s vulcanised rubber. The great thing about it is it’s what you call a molecular trap. So it’s very porous. So it picks up but then doesn’t deposit. So it’s really, really good. We use it to clean all surfaces. Obviously before having used any of these materials I’ve mentioned, I tested them on the ink, because the last thing you want is to remove the ink from the paper. Oh, what a choice! Where did you choose to test it? Yes, it’s inconspicuous, so you just find a place, and it reacted really well. So then after the smoke sponge I used Mars rubber. It’s really good because it is latex-free and it doesn’t leave any residues. I grated it – I got very small balls of rubber – and then using what we call a Wishab sponge, which again is another synthetic sponge, I used it to direct the Mars rubber along the paper. You can also do that with your finger, just rub them across, but I said let’s have another barrier layer, so I used a sponge instead. Were you nervous? At any time? No, you were clear when you tested it that you wouldn’t be taking away any of that precious ink? And I think it’s important as well you have to be confident in your treatment. Otherwise it will take you far too long. In our training here as well, we’ve all noticed how with our first object we were so hesitant to do anything. And then by the end of the year, because you’re confident because you’ve experienced it and you’ve tested it and you know through rigourous experimentation that it’s not going to negatively impact the object. So no, I wasn’t nervous and I’d done this before as well. So this was not the first time. On something as old as this? Is this the oldest paper object you’ve done? This was the most exciting part. The paper was degraded around the edges and the corners and also there were some holes, which rather than being the evidence of pinning, it seemed quite clear that it was just the paper which was degrading. But it could have been also something which nibbled under the floorboards, it’s very possible. Just because the paper will be put on display – archaeologists, conservators they will be handling it. Once you have a tear, it’s just going to get worse. So I said yes, I will do this repair to stabilise the paper, and once again, because it’s such an important find for Knole, let’s give it the best it can receive. So the way that was done is using Japanese tissue paper. There’s different kinds of paper.And this one was Tosa Tengujo, I think. And I chose it because of its thickness, because of the texture. It has these long fibres. You can cut it, you can decide how long you want those fibres. It’s very stable, it’s very strong. Very fine but very strong. The idea was to make a backing for where there were the tears. Just so that the paper has something holding it together. The thing is if you just put Japanese tissue paper which is white-ish in coloration, and also translucent, it stands out, too much contrast. One of the tenets of conservation is that your treatment should not mimic 100 per cent, so any new materials you’re adding shouldnot be 100 per cent identical. Because in the future, will people be able to tell what’s repair what’s original. In this case, because it’s historic – there’s an aesthetic to the paper as well. So I said I’ll tint it. So I did that using watercolours. So then you’ve got your backing paper ready, so the next thing is cutting the paper. I should point out that you don’t cut your ‘fill’, so to speak, with scissors, because with scissors you get a very straight, distinct line. And the eye picks that up immediately, no matter how well tinted your paper may be. You use what’s called wet cutting. You use a very fine brush, dip it in water and then draw the form or the shape you want your fill to be in. And then once your paper is wet, you just tease it out. This page was added by Veronica Walker-Smith on 22/01/2019.